Chicago IL: Mahatma Gandhi was born in Porbandar on October 2, 1869. The world celebrates the day as International Non-violence Day. Nation is remembering Mahatma Gandhi, who gave message of non-violence, truth and love to the world, on his 140th birth anniversary (Gandhi Jayanti) on today. A prayer meeting (Prathana Sabha) was arranged on Friday, Oct 2, 2009 also Sunday the 4th October “Peace March” was organized. On this occasion many Civilians, Political and Social Leaders gathered in great strength and offered flowers to the statue of Mahatma Gandhi. On 2nd October a prayer meeting was arranged between 5 to 6 pm where people gathered in large number near statue of Mahatma Gandhi and showed respect for Mahatma Gandhi and offered flowers. 2nd October 2004 “Gandhi Memorial Trust” was established, who’s Chairman and Trustee is Om Prakash Kamaria. Other Trustees are Usha Kamaria, Dr. Chandrakant Modi, Dinaben Modi, Satish Chander, Mira Chander, Dr. Sonty, Sameer Shah and Daxesh Laxpati. At present Daxesh Laxpati is President, Subhashbhai Bhatt Vice President, Pratapbhai Sampat Secretary and Mukeshbhai Shah Joint Secretary. 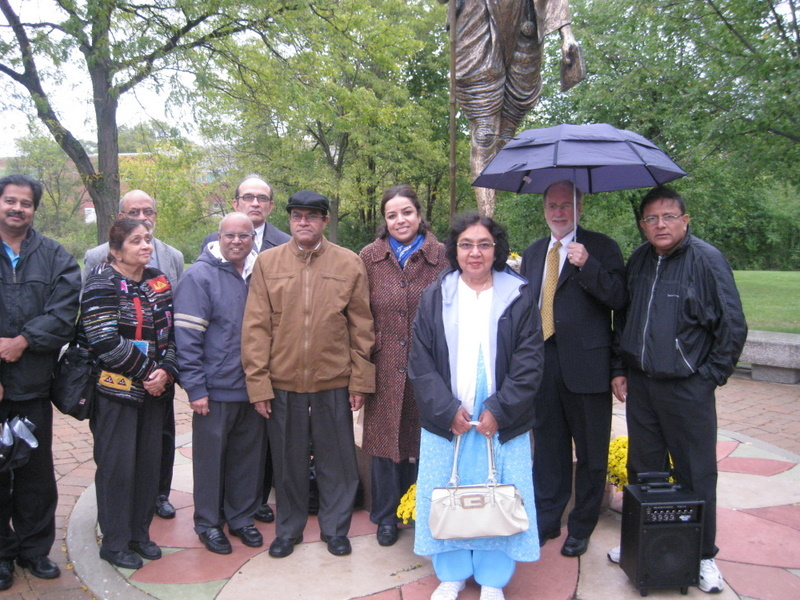 On Friday the 2nd October weather was cold, shower and windy, despite terrible weather all the Trustee of the Board including Chairman of the “Gandhi Memorial Trust” Om Prakash Kamaria, Board of Trustee Usha Kamaria and many leading citizens of Chicago’s were presence. 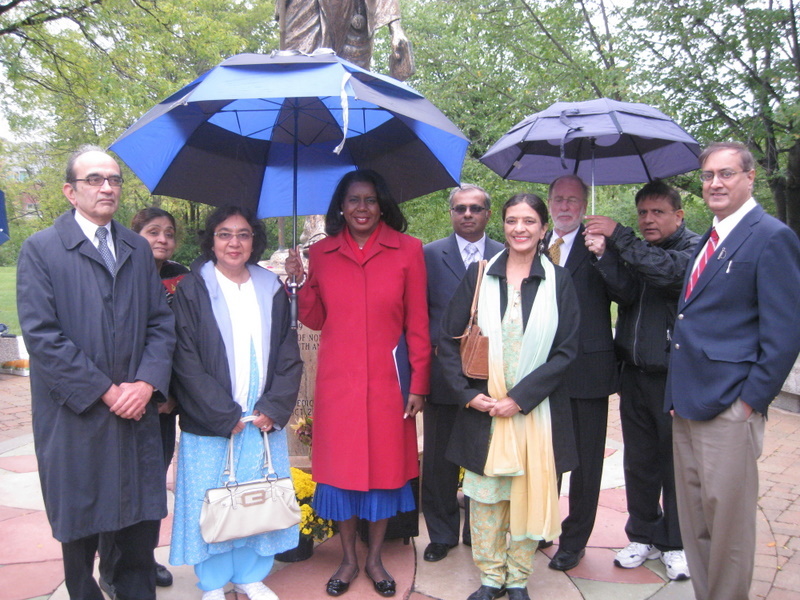 Amongst them were, Consulate General of India Ashokkumar Atri and his wife Ushakiran Atri, Clark of Circuit Court of Cook County Dorothy Brown, Mayor of Skokie George Van Dusen, CEO of Med star Lab Narendrabhai Patel, Director of Human Services of Skokie Maureen Difrancesca, President of Skokie Clergies Pasture Eric Weber. Subhash Bhatt was Master of Ceremony for the whole program. The program was started with the heartfelt recital of loving bhajan of Gandhiji “Payoji Maine Ram Ratan Dhan Payo” sung by Gitaben Bhatt (wife of Subhash Bhatt) and Neha Pathak. After reciting of bhajan it was informed that Gandhiji was chanting every day slokas of Isha-vasyam. Ashokkumar in his lecture emphasized on three things. Worshipper of Peace and Non-Violence Mahatma Gandhi’s 140th Birthday was celebrated amongst large crowed and he was very happy about it. He informed the gathering about “Mahatma Gandhi Rural Development Guarantees Scheme” declared open by Honorable Prime Minister of India Dr. Man Mohan Singh on eve of Gandhi Jayanti. According to the scheme, hundred hours employment shall be provided by Government of India for people live in small village. It is exactly like Social Security Scheme prevailing in USA. According to Ashokkumar this shall be of great help to the villagers in this situation. Shri Atri pointed out that in April 2009 in India Celebration of visit of Martin Luther King Jr’s 50 years was celebrated. Martin Luther King Jr. visited all the Ashrams of Gandhiji and was inspired by non-violence fight that he started movement in USA with a view to uplift blacks staying in USA. President Obama is following Gandhiji philosophy. 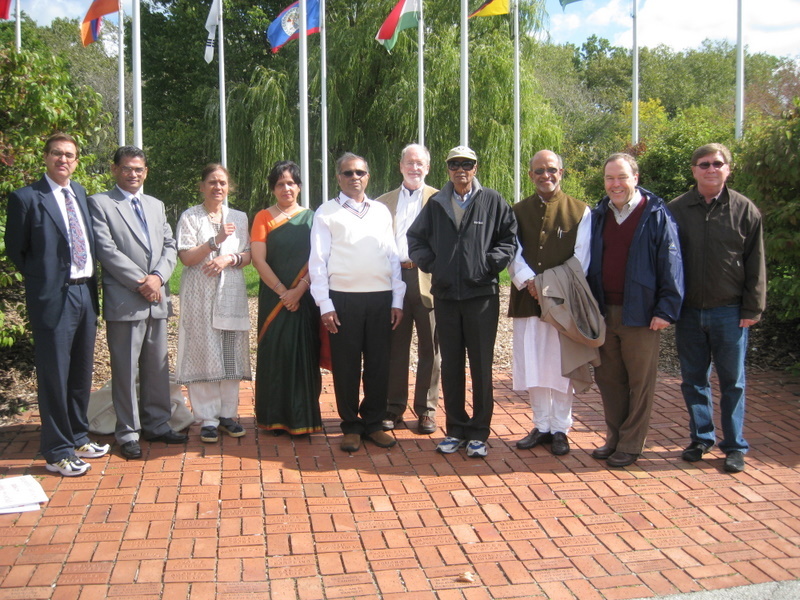 All the people present at this function requested Mayor of Skokie George Van Dusen to develop the park where Gandhi’s statue stands and to name it as “Peace Park”. 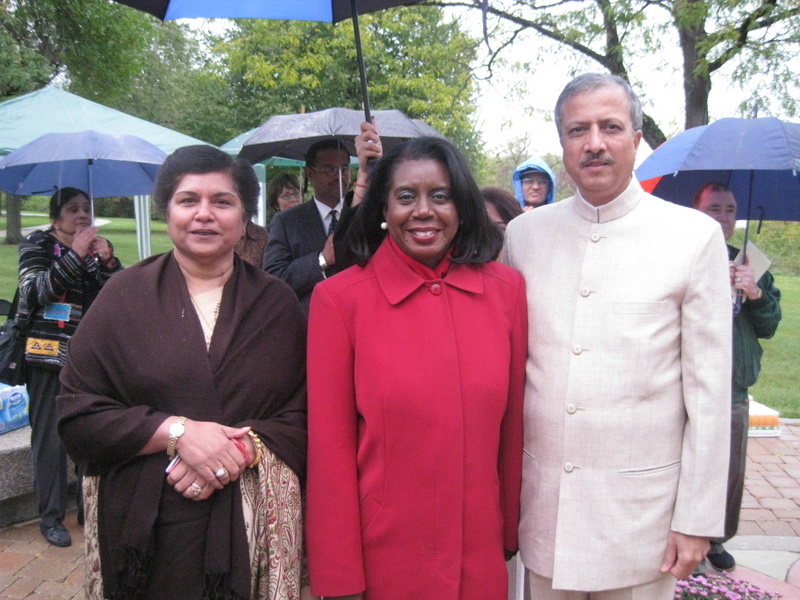 Dorothy Brown in her lecture reminded all of properties of tolerance taught by Mahatma Gandhi. She reminded that he tied all communities and races of India with one thread and achieved independence by Non-Violence. We are trying such in City Hall. Here different generations, colors, citizenships live together, and we teach them “Tolerance for each other’s Culture”. During master of ceremony Subhash Bhatt informed every occasion always there are two or four VIP’s (important person) are presence. But today near Gandhiji’s statue everybody can proudly say that all the persons present here is VIP. Each individual is great and dignitary. Gandhiji has taught us this definition of self-respect. In whole of this program distinction was every speaker after his speech offered flowers near the statue of Mahatma Gandhi. Second Phase of Celebration of “Gandhi Jayanti” was arranged on Sunday the 4th October at 1:00 pm at Flag Park Skokie in form of “Peace Walk”. People gathered there in large number. From there they walked to the north of Sculpture Park reaching near statue of Mahatma Gandhi. During this small peace walk there were famous slogans “Gandhiji Ki Jai Ho” and “Raghupati Raghav Raja Ram” were recited constantly. Afterward President of “Gandhi Memorial Trust” Daxesh Laxpati delivered welcome speech. Gandhiji started on small scale non-violence fight against color discrimination in England. This Movement changed the minds of not only Indians but whole world for 40 years thereafter. 9 Th graders student (Lilly) from Wakefield high school asked President Obama that with whom living or dead individual you will love to take dinner? Answering her President named Gandhiji which suggests that Gandhiji still lives in the hearts of all. (Jokingly Obama had informed that Gandhiji was eating too less and today’s economy is worst and people gets too less to eat.) After this Subhash Bhatt introduce all dignitaries. In his Speech Mayor George Van Dusen stressed on co-operative working. He defined “Coming together is beginning, Keeping together is Progress and Working together is Success” He attributed all saying all of you are successful because you all are working collectively on account of this whole community benefits. Dr. Katherine Schuster Prof. of Education at Oakton Community College Spoke on “In search of Gandhi in today’s India and World” told many things he has undertaken Gandhian (Gandhi Vadi) Philosophy as study and has studied in great depth. She has visited Gandhi Ashram and many relatives very minutely and nearly. Narrating her own findings on tour she said she had Gandhi darshan at many places such as Indian currency, cloth (Khadi), statues, posters of Gandhiji, Village Farmer, Modern Farmers fighting leader for ladies rights, energy saver individuals all have Gandhi in their hearts and ask for their rights by peace or non-violence. In any country of the world Gandhian thought is used towards peaceful solution of any problem. Jodh-singh Rawat himself is a Gandhian. He told in his speech on “Gandhi, a Prophet of our Time”. Lightly that it took him two hours to reach at this place because at the age of 69 years, he is learning to drive his car himself. He narrated many interesting stories about Gandhiji from his birth to the period of him, becoming Mahatma. He talks in detail about effects of “Ram Naam” and “Geeta” on Gandhiji and his Truthfulness, Vegetarian Love etc. Gandhiji was always in favor of Bhajans very much and any program incomplete without his loving Bhajans, “Ishwar Alla Tero Naam, Sabko Sanmati De Bhagwan” which was recited. In the end Mukesh Shah, joint Secretary of “Gandhi Memorial Trust” performed Vote of Thanks. In his speech he thanks all those have helped directly or indirectly in organizing of total function. Consulate General of India Shri Ashokkumar Atri and Mrs. Atri along with their complete staff for guidance, Mayor George Van Dusen for co-operating from very beginning, Naren Patel of Med Star and Sohan Joshi for co-operation (Sponsoring), Dr. Schuster and shri Rawat for their thought-provoking speech on Gandhian Philosophy and Thinking and sharing their experiences. He also thanks Vip Shah for arranging nicely distribution of breakfast and drinks sponsored by Sangam Foods and also Babubhai Dalal of Sangam Foods, Mike of Fresh Market for making arrangement of flowers for both the ceremonies. Credit of success of whole program goes to Daxesh Laxpati, Subhash Bhatt, Pratapbhai Sampat and Mukesh Shah. It is the Untiring efforts of these persons which include phone calls to invited guests and its follow up, signs of poster of Gandhiji, arrangement of water, security (Skokie Police), light breakfast, chairs, tables, tent, inviting news media, flowers, and mike systems. Past Vice President VIP Shah also participated throughout the program engaging himself in small or big work and served everyone following Gandhian theory. When “Mahatma Gandhi Ki Jai” was loudly recited the whole atmosphere became lively as if absorbed in Gandhiji. All dispersed after taking snacks and soft drinks.